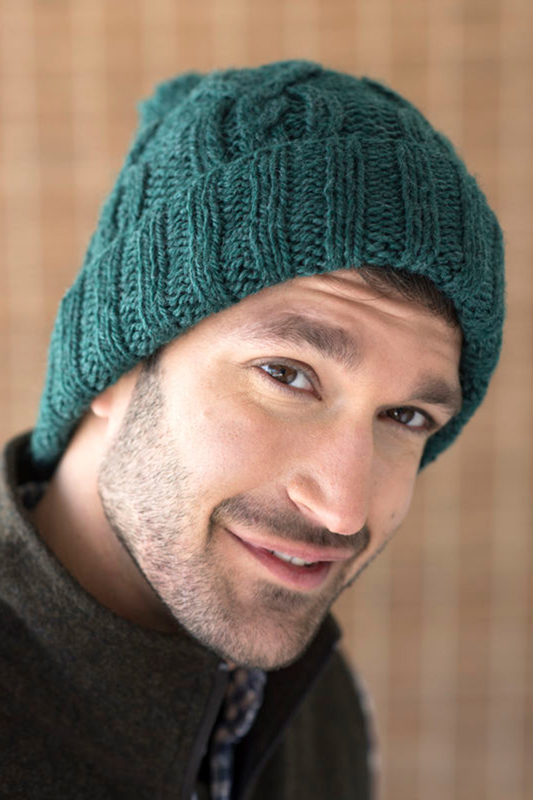 A unisex hat knitting pattern with twisty cables, Heathcliff knits up quickly in Berroco Mercado. For another variation on this cable, see Catherine. Color Shown: Berroco Mercado (100 grs): 2 hanks #4148 Oceano. Finished measurements: Approximately 18" around x 9" high (with brim folded back, not including pompom). Berroco Comfort Fall 2018 Collection Patterns - Tanager - PDF DOWNLOAD is a similar pattern: 18 (4.5 sts. / inch) finished gauge, hats and more garment, and 200 yards (183 m) yarn yardage. You may also like Berroco Booklet 399 Brielle Patterns - Charente - PDF DOWNLOAD, which is another similar pattern: hats and more garment, for unisex, and heavy worsted/aran (16-18 sts/4 in) yarn gauge. You may enjoy taking a look at the , and Berroco Mercado Catherine Bonnet kits all using Berroco Booklet 400 Mercado Patterns. Hopefully our suggested yarn options for Rosamond - PDF DOWNLOAD can help you come up with your next exciting new project idea!